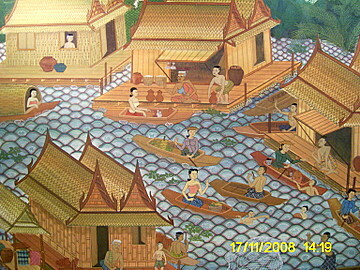 These traditional Thai paintings by a group of Thai artists were displayed at an exhibition in the River City* antique centre in November 2008. Here are some of the oil paintings by these artists on display. 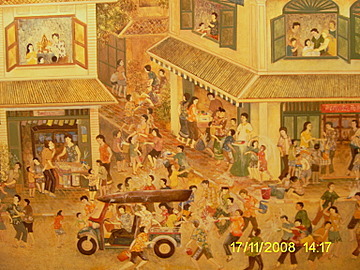 The oils depict life in rural and urban Thailand, some homes from the different regions, the cultural and ethnic diversity of various communities and colourful festivals. *River City is an art and antique centre near the Si Phraya pier. These pictures preserve the traditional way of life that is fast disappearing in favour of modern homes. 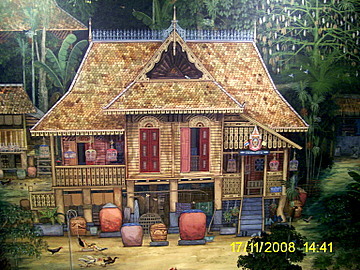 Each of the four regions in Thailand have traditional houses with distinct characteristics. 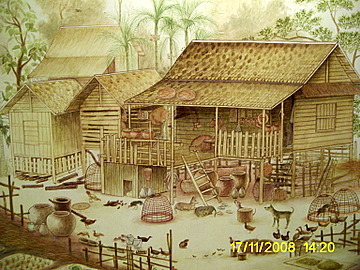 More information on the structures of Thai homes from the four major regions in Thailand, is available at traditional Thai houses. Here's a cross-section of the different communities in Thailand reflecting the cultural diversity. Such communities can be found on the banks of the Chao Phraya and also along the main canals. Salt farms are mostly found in Samut Songkhram province south of Bangkok along the coastal road. Sea water is pumped into ponds and then evaporated to derive the salt. 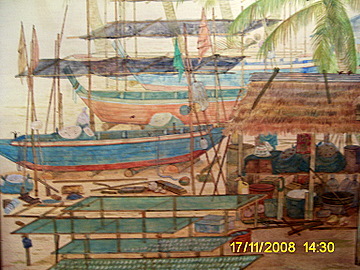 Many of the fishing communities are further south. 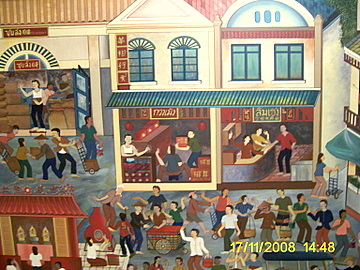 Festivals made up an integral part of the colourful Thai milieu. Here are some of them. 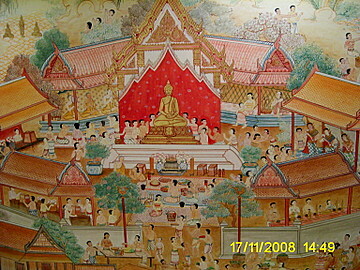 Temple activities play a dominant role in life in Thailand. 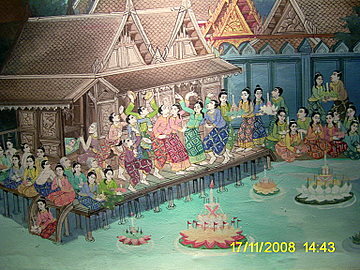 Here’s a traditional Thai temple scene. The bua or lotus flower signifies the purity of spirit and is closely associated with Buddhism. A red lotus signifies compassion and love. Lotus flowers are frequently used as offerings during worships at temples. 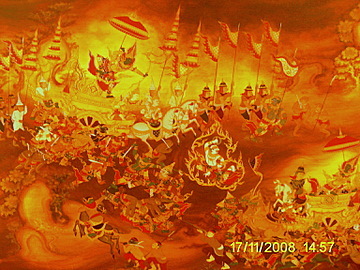 Our final photo on traditional Thai paintings is a fiery battle scene from the Thai Ramakien drama which has been adapted from the Hindu Ramayana epics. This is the final battle when Prince Rama and Hanuman the monkey god with his army of monkeys storm the island of Langa to rescue the Princess Sita abducted by the evil giant Ravana. 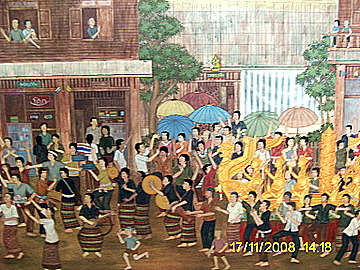 For the background to this drama, please see Khon dance. 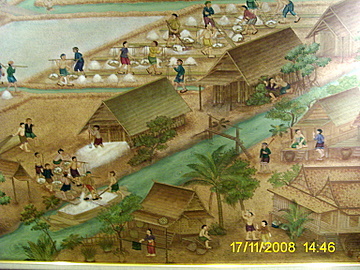 Hope you enjoyed these paintings of religious and cultural life in Thailand. 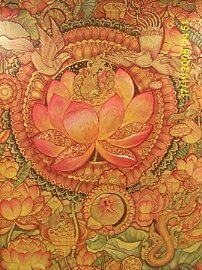 My thanks to the organizers of the art exhibition at River City antique center for kindly permitting photos of these traditional Thai paintings. 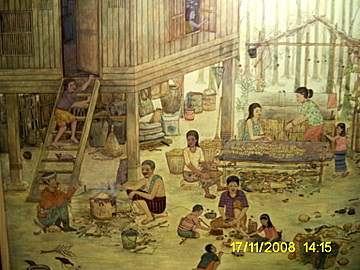 For other forms of Traditional Thai art.